문화유산은 관광객의 특수한 요구를 충족시키고 동시대의 빠른 사회문화적 변화를 반영하기 위하여 끊임없이 재구성되고 재해석된다. 따라서 문화유산과 관광의 관계는 복잡하고 미묘한 공생 관계에 있다. 이 책에서는 문화유산 관광과 민족 정체성 간의 구상적이고 상징적인 연관성을 질적 연구 방법을 통해 상세하게 기술하고자 했다. 창덕궁을 대상으로 한 민족지학적 연구를 통해 관광객들이 문화유산 관광을 경험하는 과정 속에서 자신의 민족 정체성을 재발견하고 재확인하며 소통하는 다양한 방식과 그들의 지극히 개별적인 이해 과정을 드러내고자 하였다. 공식적이고 일반화된 문화유산의 의미와 해석에 중점을 둔 기존의 연구들에 반해 이 연구에서는 개인적이고 차별화된 문화유산 관광 경험의 중요성이 부각되고 있다. 창덕궁은 한국 역사의 기본적 구성 요소와 불변하는 국가 의식의 상징으로 이해되면서 범세계적인 문화 도시로서의 서울이 가지는 현 위상과 뚜렷하게 대비된다. 또한 정치적 상황을 넘어선 원초적 문화를 강조하여 남북 간의 근원적 연계를 재조명한다. 따라서 창덕궁 관광은 한국인들에게 일상 속에서 자신의 민족 정체성과 한국문화의 지속성을 구현하며 개인화시킬 수 있는 소중한 기회를 부여한다. Heritage tourism is predominantly concerned with exploring both material (tangible) and immaterial (intangible) remnants of the past. Importantly, heritage is not always a fixed or static outcome of the past within tourism contexts. Heritage is constantly reconstructed and re-interpreted in an attempt to meet the specific demands of tourists and reflect the socio-cultural changes of the contemporary world. Therefore, the relationship between heritage and tourism is complex, intricate and symbiotic. 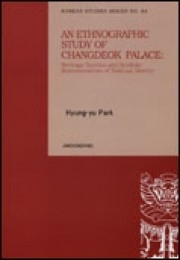 This ethnographic study of Changdeok Palace concerns the conceptual and symbolic interrelationships between heritage tourism and national identity. The study's theoretical framework suggests that heritage is not only a fundamental attribute of national culture but an important form of symbolic embodiment through which people can construct, reconstruct and communicate their sense of national belonging. Compared to the emphasis on the official and authoritative interpretations of heritage with regard to identity issues in previous studies, critical focus is placed on exploring individualised, multiple and varied interpretations of heritage. Here, heritage tourism experiences are emotionally driven and intuitively embodied. Changdeok Palace is viewed as an essential constituent of the history of the Korean nation and a timeless symbol of nationhood, stands in stark contrast to Seoul's international profile as a global city. It is a national space where conceptualising the nation is grounded in primordial culture and shared national memory, thereby representing the Korean peninsula as a whole. The study nurtures an empirically-informed assertion that the Changdeok experience can encourage South Korean citizens to embody and personalise a sense of national belonging and cultural continuity in everyday contexts.